Imagine living in a world where Love is a disease called Deliria. Imagine having a procedure that will cure before the Deliria take control of you. Imagine not being able to love, at all. That is the world that Lauren Oliver has created in her fascinating book, Delirium. In the beginning of the book we meet Lena, who is a very headstrong young lady. Life definitely has not been easy for Lena. She has believed all her life that love is something to be terrified of, and that it can kill you if you are not cured. I found Lena to be a very strong character, and I loved that she stuck to her beliefs for so long. Even when she starts to see things differently, she still clings to that belief. I love a character that doesn’t give in just after a little persuasion. Of course, things start to change once she meet’s and eventually falls in love with Alex. Oh Alex... I have to say, I love, love, love Alex. His character is one that I have thought about long after finishing the book. He definitely stands out to me for some reason, and I seriously cannot stop thinking about him. I adore him, and his relationship with Lena. I love how he shows Lena the truth of how things really are. They are seriously perfect together. Delirium is a very well paced book. While I wanted to get through it as quickly as possible just to see what was going to happen next, I also wanted to savor every single bit of it. The plot is very creative, and it definitely makes you think. I cannot imagine living in a world where you cannot feel love. That would be just horrible. Overall, this is definitely one of my favorite reads, and I can’t believe I waited so long to read it! Lauren Oliver is an amazing author, and I can’t wait to read more from her! 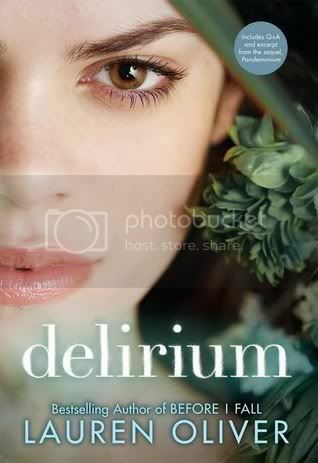 Lauren talks about The Delirium Trilogy! ** All reviews posted are my own personal opinion. Please do not let my opinion stop you from reading, or not reading and book you may very well enjoy! I loved this book! I can't wait for Pandemonium to come out. Great review. Awesome...so glad to hear how much you liked it. I'm 1/4 way through and really enjoying it. Excited to see where it goes! This is one of my favorite reads too. I'm glad to hear that you loved it too! Great review! I have this one sitting on my bookcase just waiting for me to get to it. I may just have to move it up the list! I really loved this one too Christy! It took me a little while to get into, but once I was in I couldn't put it down. I adored Alex, I just wanted to reach in and hug him! And that end? *cries* I'm a little scared to pick up Pandemonium because I love these characters so much, but I have to know what happens! Oh I thought I was the only one who hadn't read this yet. Well maybe I am now!! haha. I really want to I just haven't taken the time. It sounds like I'd like it and I love how it sounds like a real page turner. Great review! Amazing review Christy! I love Alex too...and that ending...GAH! It would be a scary to live without being able to love. I think of all the people, and things I enjoy and having that ripped away from you would be shocking. Can not wait to see your review of Pandemonium! I seriously loved this book as well! I actually have Pandemonium -gasp- and I need to pick it up and read it. I need to know what happens! I love this book to pieces!! I'm so glad you liked it, too!!! Alex is an amazing love interest and the concept for this one was amazing. I can't wait for the sequel!! Wow-I had the exact opposite reaction to the pacing, although that was partly because I thought this was a standalone (like Before I Fall). I kept waiting for something to happen and feeling disappointment when nothing did. Interesting to see our different feelings about this point! This is one of my favorite books EVER! So happy to hear that you loved it. Pandemonium is just as amazing, but in a different way. I really enjoyed Delirium too! The slow pace was something I really enjoyed especially because a lot of YA fiction, especially dystopian fiction, whips by so quickly. I like that Lauren Oliver took the time to slow down and develop her world.